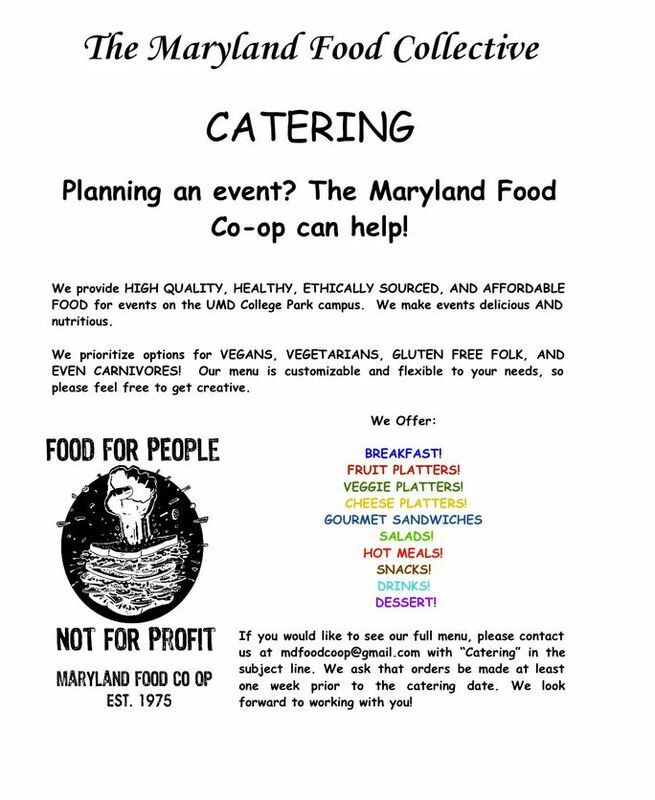 Greetings from the Maryland Food Collective, a worker-owned food coop located on the campus of the University of Maryland, College Park! The Maryland Food Co-op started in the mid-1970’s on the campus of University of Maryland. We are worker-owned which means that everyone who is hired as a “paid worker” shares an equal role and all responsibilities in operating the business of our natural food store. We also welcome people to volunteer at our store in exchange for food credit. Together, the workers and volunteers co-operate to provide cheap, healthy, veg-friendly food at fair prices. There are no bosses or managers, only people who are working for a space that maintains equality, a good atmosphere, and lots of music. We proudly offer our catering services to you this summer for any event, large or small.